Brendan Smialowski for The New York TimesPresident Obama responded to questions about the economy, health care, and protests in Iran on Tuesday. At his fourth White House news conference, President Obama spoke more forcefully than before about the violence in Iran, pushed hard for his health care agenda and acknowledged the steep unemployment rates. Please feel free to comment in the section below. A transcript of his opening statement and the question-and-answer session. A Brief Wrap | 1:33 p.m. | Helene Cooper: Well, Sheryl, he really ramped it up on Iran. We heard the president use the word “condemn” for the first time since the Iranian elections to describe the government’s actions. It will be interesting to see what comes next from Tehran in response. Sheryl Stolberg: Yes, I was struck especially by his last answer to Suzanne Malveaux about the “heartbreaking” video. He showed more passion than earlier in the press conference. And speaking of passion, I was also struck by the way Mr. Obama seemed irritated with reporters at various times during this news conference. The cigarette question seemed to really get under his skin. He rarely loses his cool, but there were more flashes of anger here than in the past. On health care, Mr. Obama did not surprise me by walking a fine line and steering clear of any efforts by reporters to pin him down on specifics of a plan. He wants enough maneuvering room to work with Congress in the weeks ahead. while using his bully pulpit to make the case that reform is a necessity, not a luxury, as he said here today. And he would not directly answer a question as to whether a public insurance option, which he supports, would be nonnegotiable when it comes to final legislation. It’s Over | 1:31 p.m. | Sheryl Stolberg: Mr. Obama leaves the room. “No questions about Iraq or Afghanistan?” a reporter cries out. The question hangs in the air. It does seem amazing, not a single question for the American president about the nation’s two wars. Neda — ‘Heartbreaking’ | 1:27 p.m. | Helene Cooper: The last question goes to CNN’s Suzanne Malveaux, who returns to the violence in Iran, and asks him about Neda, the Iranian woman who died on television after being shot in the heart. Has he seen the video? No Interruptions | 1:24 p.m. | Sheryl Stolberg: A Helen Thomas moment! The octogenarian “dean of the White House press corps,” who rarely gets called on anymore, tried to interrupt the president as he was talking about Iran. “Hold on, Helen,” Mr. Obama said. While he acknowledged that those rates are typically higher than the national average, he asserts that the best thing he can do for any community is to “get the economy as a whole moving.” Ms. Ryan looks displeased; “Hold on,” Mr. Obama tells her, preventing her from interrupting him. He says he wants to beef up proven jobs programs, not start new ones. “Part of what we want to do is to find tools that will give people more opportunity, but the most important thing we can do is lift the economy overall.” Ms. Ryan tries for a follow-up, but Mr. Obama turns to another reporter. A Second Stimulus | 1:20 p.m. Helene Cooper: Hans Nichols of Bloomberg just asked whether the administration believed the economy would require a second stimulus package. “Not yet,” is the reply. 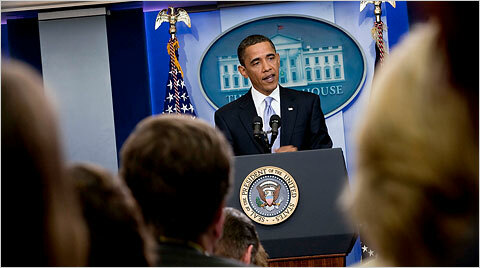 Mr. Obama said it’s important to see how the economy evolves and how effective the first stimulus package is. “No one initially understood the depths of the recession,” he said. While saying unemployment will go above 10 percent, Mr. Obama declines to say how far above 10 percent it will go. “I’m not suggesting I have a crystal ball since you threw back our last prognosis at us, I’m not engaging in another one,” he tells Hans, who grins back at him. Mr. Obama at last addresses the question directly — by not addressing it. He says, “We are still early in this process so we have not drawn lines in the sand, other than reform has to control costs. and it has to provide relief to people who don’t have health insurance or are underinsured.” He says that “it is too early to say” if he will draw a similar line over the public plan. More broadly, Mr. Obama says he wants new rules for all insurance companies — that they can’t “cherry-pick” healthy patients. And he takes a jab at the insurers, saying that too often they have spent time thinking about how to take premiums and not enough time thinking about other issues, like the health of patients. This kind of populist language is interesting; Mr. Obama has made a point of wooing industry to try to keep insurers, the pharmaceutical companies, doctors and others at the negotiating table. He doesn’t often take shots at them. Spock Ears | 1:07 p.m. The president himself jokes about the size of his ears — which most recently were made fun of in a monologue about nerds and geeks and a video played at the radio and TV correspondents’ dinner last Friday. Who’s the President? | 1:02 p.m. | Helene Cooper: Mr. Obama just called on CBS News, which asked again about the administration’s response on Iran, and whether he was influenced by the criticisms of Senators John McCain and Lindsey Graham — who have urged the administration to be more forceful. Mr. Obama seemed to smirk: “What do you think?” which got a lot of laughs. But he then reiterated that he doesn’t want to be a tool of the Iranian regime. “There are reports suggesting that the CIA is behind all of this,” he said mockingly. Uphill on Health Care | 12:59 p.m. | Sheryl Stolberg: Now Mr. Obama has a chance to weigh in on the specifics of his health care bill. David Jackson of USA Today asks if he will sign a bill without a public plan in it. But Mr. Obama appears to be ducking the question; he launched into a broader discussion of why health care reform is necessary and how the rising cost of care will break the national bank if it is not reined in. He says that if a bill does not control costs “that’s not a bill I can support.” He says that while we are in the process of dealing with the cost issue, it is also “wise policy and the right thing to do” to start providing coverage to people who don’t have insurance. This is interesting; it suggests that Mr. Obama views health reform as more of an economic imperative than a moral one, the flip side to the way many Democrats have viewed it in the past. On the public plan, Mr. Obama says it is an important tool “to discipline insurance companies” — another way of saying, as he has in the past, that a government-run plan will keep private insurers honest. He says it makes sense “for us to be able to say here’s a public option that’s not profit-driven, that can keep down administrative costs,” and that will provide good quality care. He predicts “some healthy debates” about the shape that this takes, and concedes there are ”legitimate concerns on the part of private insurers” that they would be unable to compete with a government plan that offered endless federal subsidies. But he disputes the notion that private insurers cannot compete with a public plan. “That defies logic,” he said. But in the end, he does not answer the question of whether he would sign a bill without a public plan in it. Brendan Smialowski for The New York TimesPresident Obama held the first afternoon press conference of his presidency on Tuesday at the White House. Where’s the Outrage? | 12:53 p.m. | Helene Cooper: Major Garrett just challenged Mr. Obama’s tone on Iran, essentially asking why he waited so long to show any outrage and whether he’d been inconsistent. “I don’t think that’s accurate,” the president replies, defending himself. “Track what I’ve been saying. Right after the election I said we had profound concerns about the nature of the election, but that it was not up to us to determine what the outcome is.” And he added, “The United States will not be a foil” for the Iranian government to accuse of meddling. Mr. Garrett asked about whether Iranian diplomats and American diplomats would still be permitted to mingle. Mr. Obama didn’t answer that. The Fed | 12:47 p.m. | Sheryl Stolberg: Facing a decision about whether to replace Ben Bernanke as chairman of the Federal Reserve, Mr. Obama ducks a question about his future, but gives him a presidential thumbs up. “I’m not going to make news about Ben Bernanke, although I think he has done a fine job under very difficult circumstances,” Mr. Obama says. Iran and the Web | 12:41 p.m. | Sheryl Stolberg: In a nod to Iranians’ use of the Internet, the president calls on Nico Pitney of The Huffington Post, which has been soliciting questions from the people of Iran. 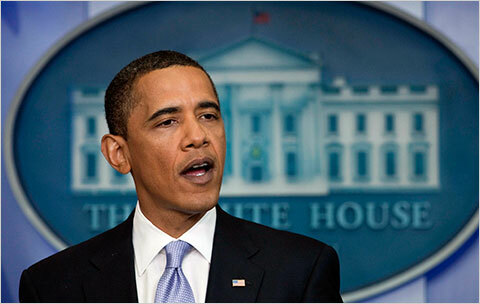 Mr. Obama is asked under what conditions he would accept the election of Mahmoud Ahmadinejad. First Up, Iran | 12:39 p.m. | Helene Cooper: The first question went to Jennifer Loven of the Associated Press. She asked him if he still plans to engage with Iran’s regime, given the crackdown on protesters. He reiterated that Iran must decide how to respond to America’s offer to engage. “The fact that they are now in a the midst of an extraordinary debate” could color that response, he said. Energy legislation is one of his top priorities, and Mr. Obama is using his remarks here to repeat an argument he has made before, that “the nation that leds in the creation of a clean energy economy will be the nation that leads the 21st century global economy.” The House is set to vote on its version of a bill later this week. A Tougher Tone on Iran | 12:32 p.m. | Helene Cooper:President Obama walked into the briefing room at 12:31 p.m. This is the first time that Mr. Obama has used the word “condemn” in relation to the Iranian regime’s actions against demonstrators. Mr. Obama has very much upped the ante in his rhetoric on Iran. These are much sharper and to-the-point comments then anything than the more measured tones he struck last week on Iran. Our colleague Jeff Zeleny tells us that the scene inside the briefing room is chaotic as reporters wait for the news conference to start, because the space is notably smaller than the formal setting of the East Room where prime-time news conferences take place. Dozens of reporters and photographers lined the sides of the room and spilled outside the doorway. The White House says Mr. Obama will touch on jobs, energy, health care and Iran in his opening remarks. But Iran and health care will almost certainly dominate the follow-up questioning. On Iran, Mr. Obama is under pressure from Republicans and conservatives to strike a harder line against the Iranian regime and its crackdown against election protesters. Even some supporters of Mr. Obama say that they believe that the president should at least come out and use the word “condemn” in relation to the Iranian regime’s violence against demonstrators. So far, Mr. Obama has stuck to a measured, moderate line, calling for justice in Iran and invoking the American civil rights movement and the Rev. Martin Luther King Jr., but has not harshly criticized the Iranian regime. White House officials say that they fear a sharper tone will do more harm than good, by giving Iran’s rulers an excuse to paint the protests as American-led. The big question today: in view of the graphic video of the 26-year old Iranian known around the world as Neda, the woman who died on television after apparently being shot in the heart at a protest on Saturday, will Mr. Obama feel he has to increase the temperature and condemn the regime? Iran’s Guardian Council also said todaythat it isn’t going to annul the vote, so Mr. Obama may decide to comment on that as well. Health care is Mr. Obama’s highest legislative priority, yet his plan to extend coverage to the nation’s 45 million uninsured is running into serious roadblocks on Capitol Hill. Republicans and some moderate Democrats are opposed to Mr. Obama’s call for a public, government-run insurance plan to compete with the private sector, and even some Democrats are uneasy. And Democrats were dealt a serious setback last week when the Congressional Budget Office determined that one of the major plans under consideration would cost at least $1 trillion over 10 years – and cover only 16 million people, a number that could not by any stretch of the imagination be considered universal insurance. Mindful of the failures of Bill Clinton, the last Democratic president who tried to overhaul health care, Mr. Obama has been trying to stay out of Congress’ way. But some Democrats say privately that it’s time for him to exert some presidential muscle. The big question today: Will he use his news conference to do it?